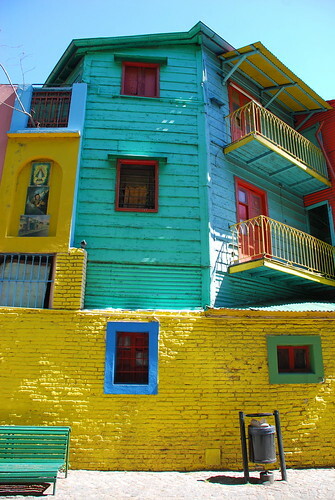 Caminito and the surrounding neighborhood, La Boca, is kind of an odd tourist spot. 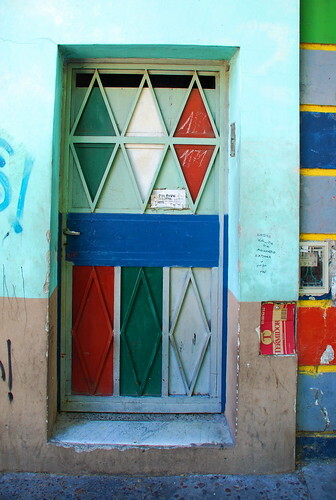 La Boca is a working class neighborhood originally built-up by Italian immigrants at the mouth –or “boca”— of the Riachuelo River. The river isn’t exactly pretty here, La Boca is known for being sketchy, and yet, Caminito is also an extremely touristy area. Despite all of this, Caminito (“little road” or “little path”) is colorful, festive, and, well worth a visit…just use common sense, watch your purse/wallet, and get into the festive spirit. The houses here are painted in a rainbow of bright colors, and many of them have balconies with colorful wooden figures in comical scenes. It’s no wonder that the artists that line the streets are inspired to recreate these buildings on canvases. Street performers play while parading up and down the street and tango dancers perform at the bars and cafés. 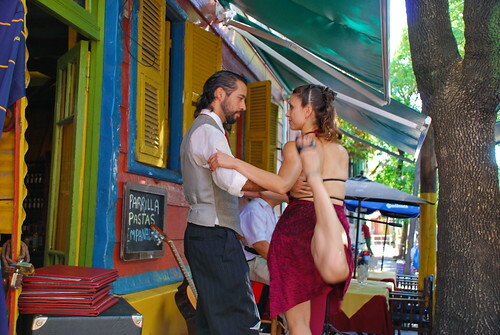 (La Boca competes with San Telmo in claiming itself the original home of the tango.) Our group happily whiled away a couple of hours watching a performance and drinking beers at one of these cafés. This is another good area to look for souvenirs, but I’d recommend bypassing the crap chachcky stores and look for a piece amongst the cityscapes and tango scenes painted by the artists in the area. You’ll find works in all price ranges. For more pics of Caminito check out this slide show. La Boca is supposedly on an upswing, demonstrated best perhaps by the fact that Francis Mallmann, one of Argentina’s most celebrated chefs, chose to open a high-end restaurant here in 2009, just off the entrance to Caminito by the water. Patagonia Sur is almost completely hidden, with no major discernable markings or signage, in a converted 1920’s Italian-style townhouse on a corner. It’s so hidden in fact, that our cabby seemed reticent to drop a couple of foreigners at the given address in this neighborhood in the evening. We did manage to find the place though, and once we rang the doorbell, stepped inside, and got seated, we found ourselves dining in a cozy home. 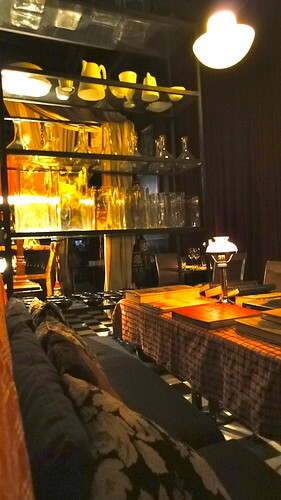 The restaurant has just a few tables nestled among books shelves and dining room furnishings all in dark woods and red tones under low lights that set a comfortably romantic mood. The prix fixe menu focuses on elevated Argentine cuisine—which means a lot of meat, of course. Despite the Argentine focus, I didn’t see any Argentines dining here the night we went. I suspect that this is because only foreigners are willing to pay the hefty price tag. At $620 ARS/$140 USD per person before alcohol, this is a splurge even by New York standards. 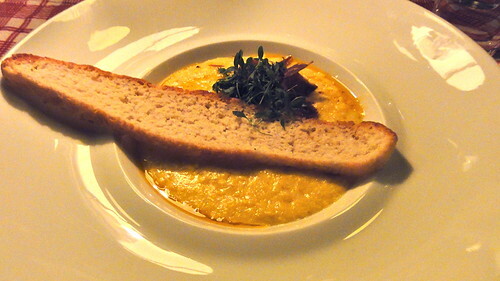 A splurge of a meal, yes; however, the three courses and accompanying appetizers were delicious. The meal began with a few small plates for the table to share—a basket of freshly baked breads, crispy potato skin chips, and an irresistible eggplant dip reminiscent of baba ghanoush with a smoky, charred flavor. For my first course I chose the humitas, which is typically a very humble dish. Here too the presentation was simple, but their version was sooo indulgently creamy. It’s the type of dish that I would love to curl up with on a rainy day. 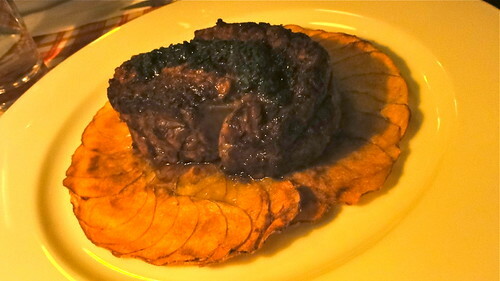 My second course—rib eye with chimichurri and patagonia potatoes—was another beautifully straightforward composition. There was nothing particularly new about this dish, but when eaten together, the elements came together brilliantly and elevated each other. The delicately crisped potatoes contrasted with the tender, juicy meat, and the garlicky chimichurri enhanced all of the flavors. A truly sublime steak! We did experience one kink in our dinner service, though. While my steak was prepared perfectly, the Beef Tenderloin with Bacon, Sage, and Crispy Potatoes Greg and one of our friends ordered came out well done. Now, in Argentina the default is to cook steaks to well done if no preference is stated. (If you like your steak medium rare, make sure you specify that you want it "Jugoso.") That said, this is an international caliber restaurant, they did ask our preferences, and everyone at our table ordered their steaks medium rare. I HATE sending food back, but at the price point I really thought the steak had to be spot on, so we did send them back. When the new tenderloins came out they were delicious. Our waiter also kindly sent out a couple of dessert wines to enjoy with our last course. I really believe that how a restaurant handles a mistake or complaint says so much about the establishment. They were very gracious, so this was only a blip in what was a really lovely evening overall. But let's not close out the evening just yet, because those dessert wines accompanied a fantastic line-up of sweet treats. Since there were five us at dinner, we just each ordered an item and shared the lot. On some prixe fix menus dessert can kind of be a neglected course, leaving one feeling that perhaps the same attention was not paid in it's creation as with the rest of the meal. That definitely wasn't the case here. Each one was delicious. As with our previous courses, our options were mostly classics—chocolate soufflé, lemon crostada, crêpes, flourless chocolate cake—each very well prepared. 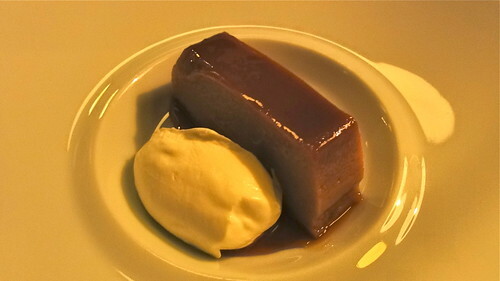 Hands down my favorite was the Homemade Flan with Dulce de Leche and Whipped Cream. Usually, I don't even like flan all that much—not even my mom's, which by most accounts is fantastic. (Sorry, Mom.) This version was so smooth and creamy, and it tasted so purely of dulce de leche that I found myself scrapping the plate and licking every last bit off my spoon. Dinner definitely ended on a very high note. 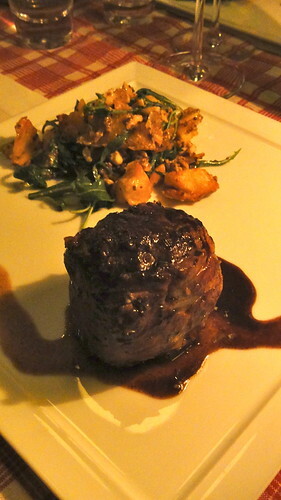 Overall, the food was excellent—Argentine classics expertly prepared. Nonetheless, I can’t help feeling the price was slightly out of step. 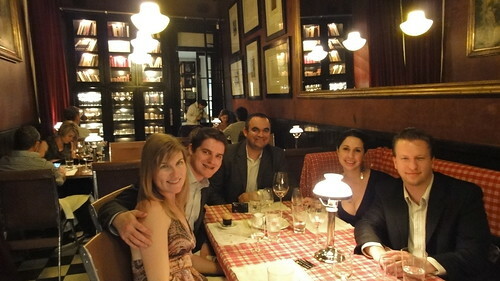 On the other hand though, while I might gripe a little about the bill, we all left happy and completely stuffed. Greg almost had to be rolled back to the hotel. 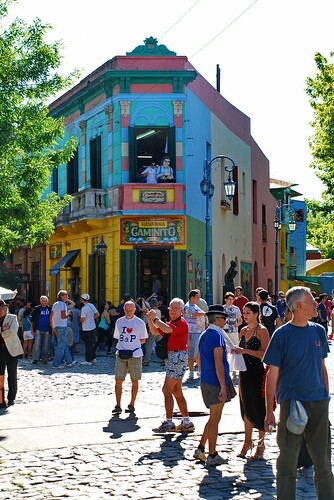 For more info on Caminito and La Boca check out this National Geographic Walking Tour.